Panthenol is a popular ingredient for both skin and hair care products. Hair care products that use this ingredient are said to have enhanced moisturization effects and add thickness or body to the hair. Proctor and Gamble has built their entire Pantene Pro-V line of products to capitalize on the properties of this ingredient. There seems to be a bit of confusion, however, about the role of panthenol in a formulation and whether or not it is beneficial or possibly even harmful for curly hair. 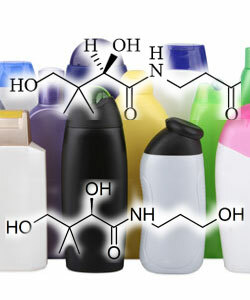 A closer look at the chemistry of panthenol should provide clarification about this ingredient. Panthenol is a derivative of vitamin B5 (pantothenic acid) and is known as a provitamin. Panthenol is what is called a chiral molecule, or one that has a molecular structure that gives it a "handedness," either right-handed (dextrorotatory) or left-handed (levorotatory). These two mirror-image enantiomers are not superimposable on one another, in the same manner in which your two hands are mirror images of one another rather than exact duplicates. Oftentimes, the two versions of a molecule have differing chemical or biological properties. For cosmetic purposes, panthenol is supplied either as a racemic mixture (50/50) of both types of enantiomers or as the purified "D" version. This is most relevant in skin care applications, as the D-version of panthenol is the biologically active version. The multiple hydroxyl (-OH) groups on the panthenol molecule impart most of the physical properties to it, most particularly its high solubility in water and other solvents. Panthenol is a highly effective humectant, a class of ingredients used in skin and hair care products to promote moisture-retention. It has a highly hydrophilic and hygroscopic chemical structure which attracts water from the atmosphere and binds it to various sites along the molecule. Humectants typically possess multiple alcohol (hydroxyl) or similarly hydrophilic sites (such as ethers or ammonium groups), which are available for hydrogen bonding with water molecules. Hydrogen bonding between humectants and water aids in moisture-retention by minimizing water loss due to evaporation. Panthenol is not only a humectant, but is also a useful moisturizer and emollient. It spreads evenly on the surface of hair strands, forming a smooth film on the surface of the cuticle. This film gives enhanced coherence to the reflection of light from the surface of the hair, which imparts significant gloss and shine. The smooth film also provides excellent slip between adjacent strands of hair and detangling properties. Panthenol is capable of penetrating the cuticle and entering the hair shaft as well, where it aids in moisture retention and provides volume. It is important to note that sometimes penetration of the shaft by ingredients can create a rough cuticle surface and lead to frizz, due to swelling of the hair shaft. This may not occur for everyone and is dependent upon several factors, including porosity of the hair and the amount of the ingredient used in the product. It is a potential undesirable effect, so keep this in the back of your mind when using a product containing the ingredient. Although there is a persistent rumor that panthenol creates waxy buildup on hair, there is no evidence to support such an assertion. Panthenol is not at all similar in structure to waxy materials. It is also extremely water soluble, alcohol soluble, mildly soluble in glycerin and is fairly easily capable of being mixed into most oils. Additionally, panthenol has no component to its chemical structure that would cause it to bind tightly to the surface of a hair strand. For these reasons, it should be easily removed from hair by rinsing, washing with mild shampoo and even conditioner cleansing. If one is experiencing problems with build up and unpleasant hair texture when using a product containing panthenol, the issue is more likely due to other ingredients in the formulation. Panthenol is readily absorbed by skin, and as the precursor of vitamin B5, it directly impacts metabolic processes in epidermal cells. It has been found to have many beneficial properties for epithelial tissue, including increased hydration and improved elasticity and is believed to promote cell regeneration. When used in shampoos and conditioners, panthenol conceivably provides added benefit by improving scalp health and potentially improving hair growth. Panthenol is a naturally-occurring material that adds several beneficial properties to hair care formulations. It is a humectant, emollient, glossifier, detangler and moisturizing agent. It is highly water soluble and is also easily removable with mild plant-derived oils or via conditioner cleansing. When selecting humectant-containing products, one must keep in mind the climate in which they live, how that impacts hair and how they might expect a humectant to contribute to the overall performance of their own hair within the constraints of that climate. Also, depending upon the porosity of your hair and the type of product being used, you may experience a roughened hair texture or some frizz due to penetration of the hair shaft. If this should happen, it might be best to discontinue use or to decrease use of the product. Finally, experimentation is the best way to find out what works well on your own hair.